As part of any entrepreneurial pursuit, founders and VCs engage in various mating rituals that are as much about judging risk as they are about judging opportunity. Over the weeks and months of pitching, founders and VCs manage to assign some subjective meaning to various parts of the risk stack. will be managed so as not to hurt your chances of success. However, your reality is that risk along each of these axis, if not taken earliest possibly opportunity will GROW exponentially. Risk is good when quantified early and taken early. Unknown risk equals infinite risk for startups. 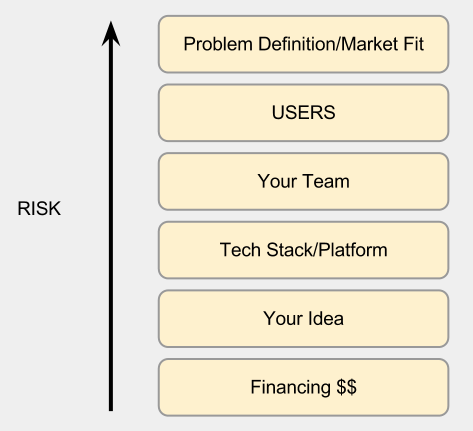 The risk stack is contained only by explicitly addressing each component of it as early as possible – before or at least at the first financing. Another danger is that risk not taken turns toxic in startups. What I mean is the effects of that risk will start to influence other areas. For example, if user related risk is the highest risk not taken, lack of knowledge about how users perceive your product or interact with your product will quickly seep in to other decision-making. In this instance, not knowing the user’s ability to understand the value will invariably lead to sub-optimal decisions across design, features, and operations. If there is anything I have learnt in the past few years in my experiments in small investments and working with early stage teams, it is that I am learning how to help founders figure out risk and perhaps help them take more risk as soon as possible. p.s. Business model intentionally not part of the risk stack. That is a composite risk which merits more thought before I can say anything meaningful about it.